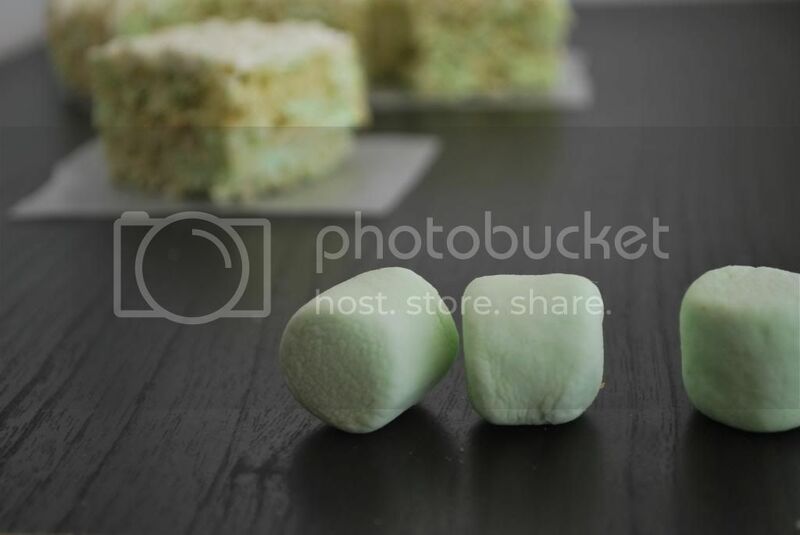 After much Google searching for lime desserts, lime snacks, lime anything... I've come to realize there aren't that many lime desserts out there. I mean after you conquer the key lime pie/bars, there's not much else. The only other thing that kept popping up was lime mojitos. 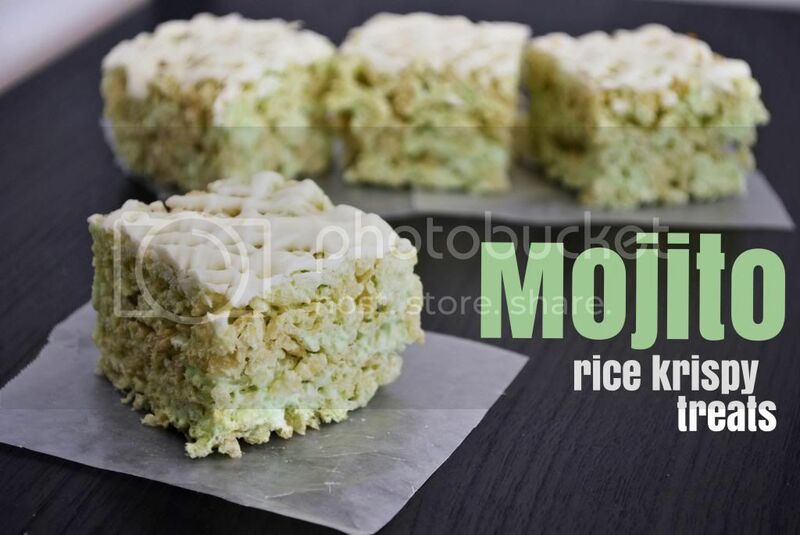 Now I don't drink, so my confidence level for making a mojito rice krispy treat wasn't every high, kind of like a vegetarian making a filet minion or something. But today I got up my guts and decided to go for it. Good idea Summer. Good idea. So as far as Mojitos go, I went with the traditional lime mint version. (that is the traditional flavor right?... yes. Just say yes and make me feel good) The lime marshmallows are obviously the base flavor, creating some tangy citrisy deliciousness. 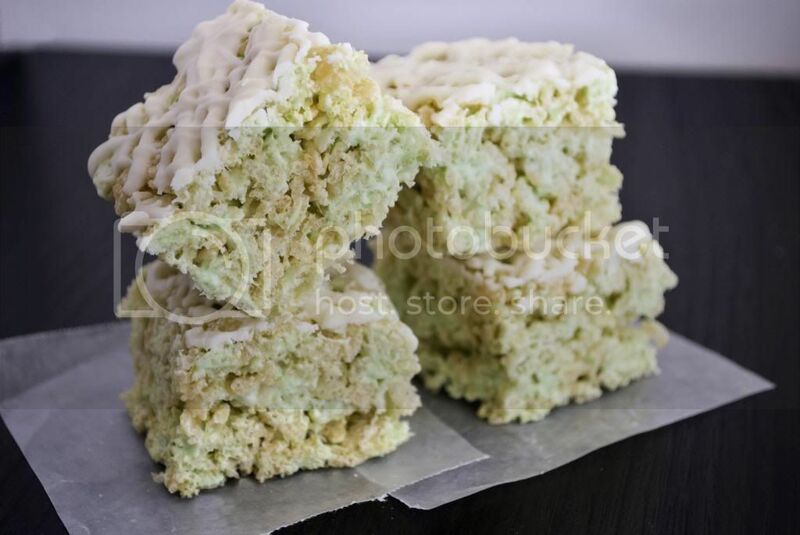 And to bring in the hint o' mint, I used a mint flavored white chocolate drizzle to top it off. Authentic. Yummy. I don't know if these taste like the real thing but dang they're good. Once fully melted, take them off heat and pour over the rice krispies. Stir lightly to combine. Dump into a lightly greased 9x9 pan and let sit 5 minutes. Then go and light press into the pan with greased hands. Allow them to cool. Meanwhile melt your Almond Bark in the microwave at 20 second intervals until it is all melted. 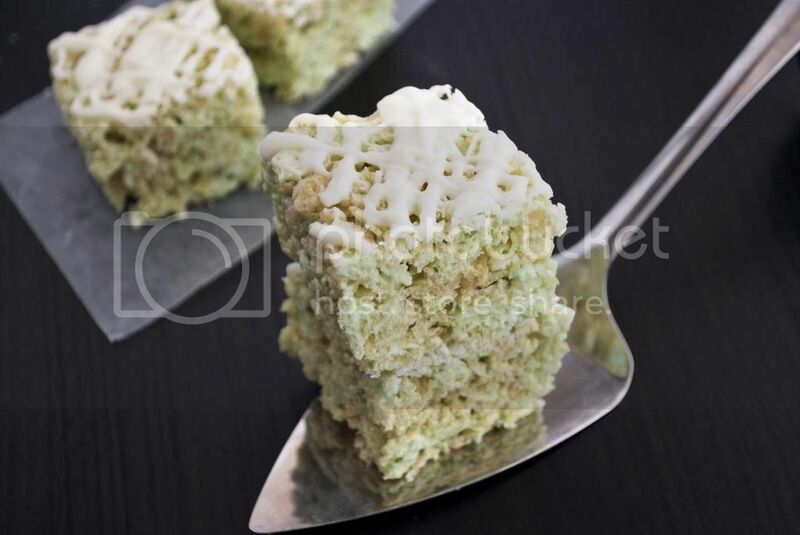 Stir in the mint extract and drizzle this goodness all over your treats. Allow to fully cool for about 20 minutes. Enjoy! What another neat idea!! I need to try these!! They are pretty good ones! Awesome flavor!!! I have a bag of those. Must make them! Definitely ones to try - thanks! Tell me what you think! I love to hear from you!